We had company this weekend, so didn't get much stamping or crafting done, but I did enjoy having them here. My brother even came for a visit and stay for the weekend. These two cards I created a while ago and just remembered that I need to share them with you. 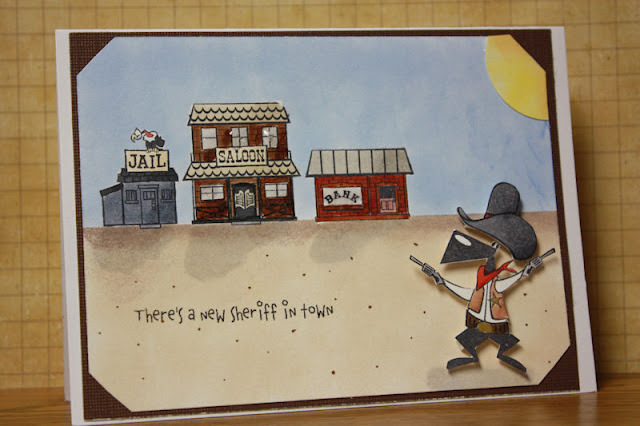 The first card uses all October Afternoon products, and I sponged the background scene with Momento Ink. I colored all the images with my copics, as well as added some tufts of grass. The next card is another scene card using stamps from Cat's Pajamas. I colored all the images with copics, and sponged the background with Momento Ink. I also added some shadows with my copics.